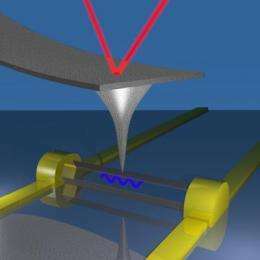 Semiconductor gallium nitride nanowires show great promise in the next generation of nano- and optoelectronic systems. Recently, researchers at the McCormick School of Engineering have found new piezoelectric properties of the nanowires that could make them more useful in self-powered nanodevices. Just 100 nanometers in diameter, nanowires are often considered one-dimensional. But researchers at Northwestern University have recently reported that individual gallium nitride nanowires show strong piezoelectricity  a type of charge-generation caused by mechanical stress  in three dimensions. "Although nanowires are one-dimensional nanostructures, some properties  such as piezoelectricity, the linear form of electro-mechanical coupling  are three-dimensional in nature," Espinosa said. "We thought these nanowires should show piezoelectricity in 3D, and aimed at obtaining all the piezoelectric constants for individual nanowires, similar to the bulk material." "The measurements were very challenging, since we needed to accurately measure displacements 100 times smaller than the size of the hydrogen atom," said Majid Minary, a postdoctoral fellow and the lead author of the study.